In business, there are times when you share confidential information with another party, but do not want the party to share it with others. In these situations, you need to sign a non-disclosure agreement with that party. 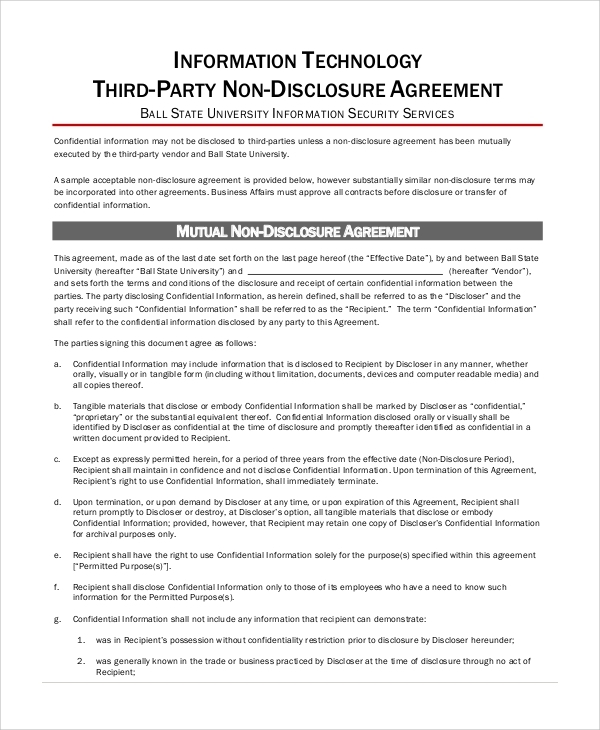 Here, you need a NonDisclosure Agreement Form to sign the agreement. 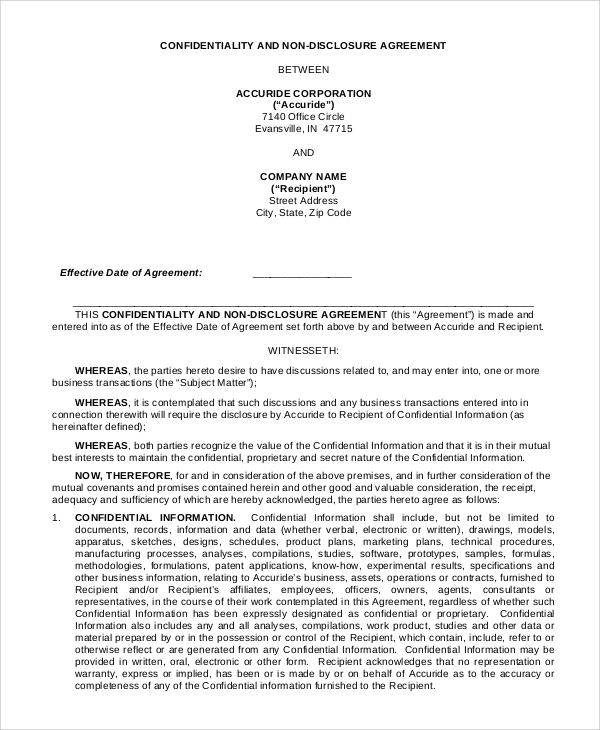 These documents contain all the terms based on which the agreement is signed. Here are some Sample Forms and you can check out the format from these. 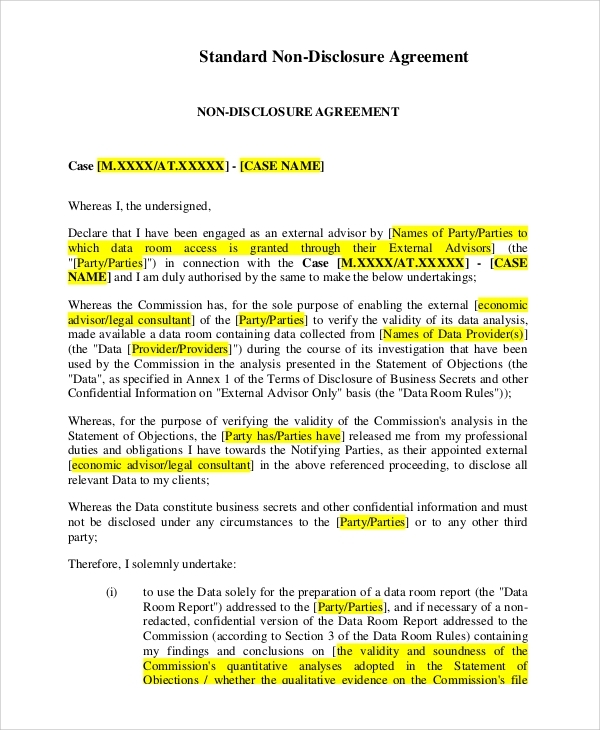 In this Sample Confidential Disclosure Agreements, the names of the involved parties are presented at the top along with the date from which the pact will be effective. 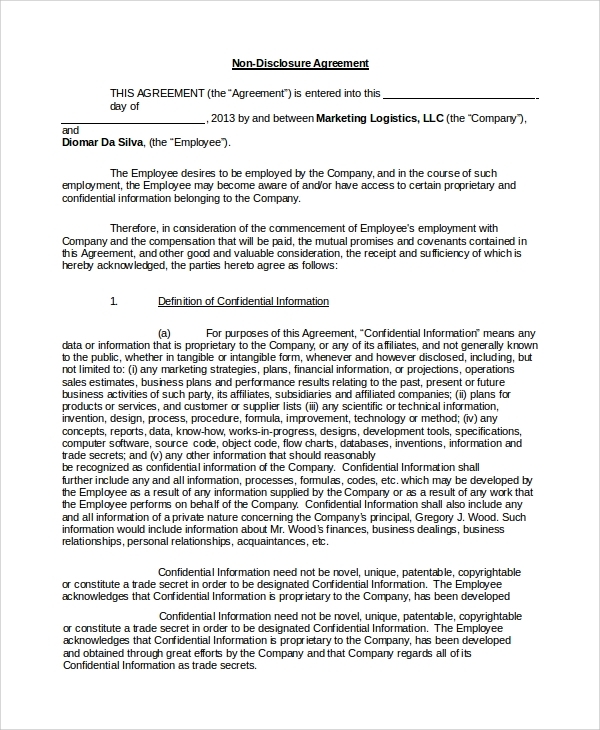 Separate paragraphs with respective subheads are used to specify the terms of the pact in this document. 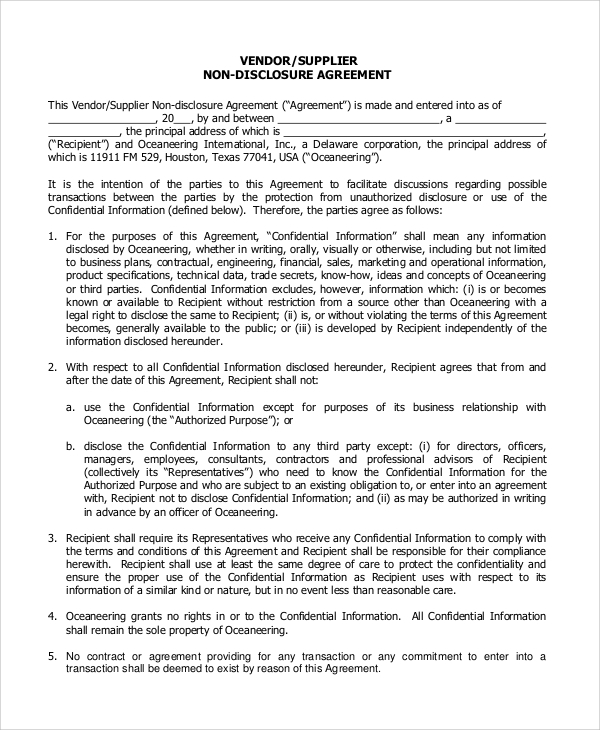 People dealing with merchandise need to sign this agreement with the suppliers so that the figures of goods are not disclosed to the competitors. The court orders, duties to protect the information and other clauses are specified in separate paragraphs. Why is it Necessary to Sign these Agreements? The greatest benefit of signing a non-disclosure Agreement Samples is the privacy that you get. You can remain confident that the information shared with the party will continue to be a secret, thereby maintaining the privacy of your firm. This is crucial as vital business strategies, and marketing information may be leaked out of there is no serious agreement between the two parties. For instance, third party offshore data entry professionals often sign these agreements with their clients to warrant the security of their data. One can also tailor the use of data for certain cases through these agreements. There may be situations where only a part of the data is required, and the pact ensures that no data is misused. 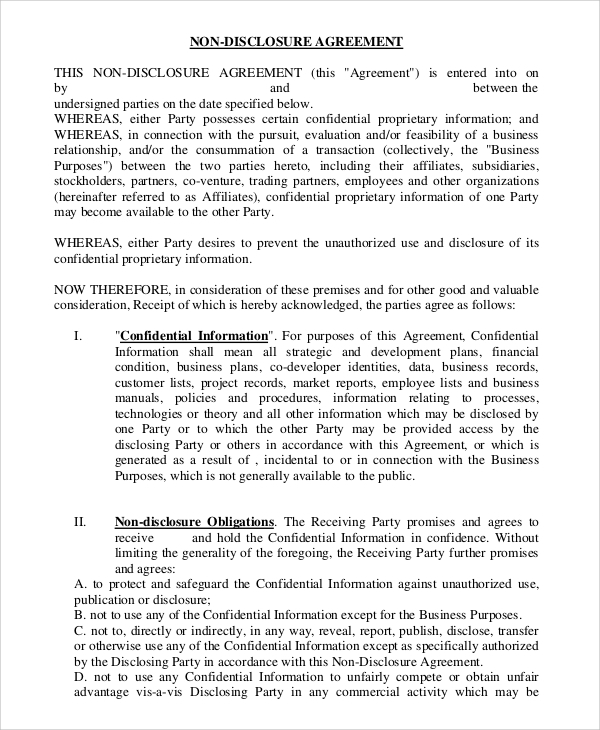 The name of the company and the purpose of the agreement are mentioned in the document. The clauses are placed one after another, along with markings. In this case, the agreement involves an IT firm and some other party. This is a template where the areas where to use the information are specified. The names of the parties are included at the top, followed by the clauses of the agreement. 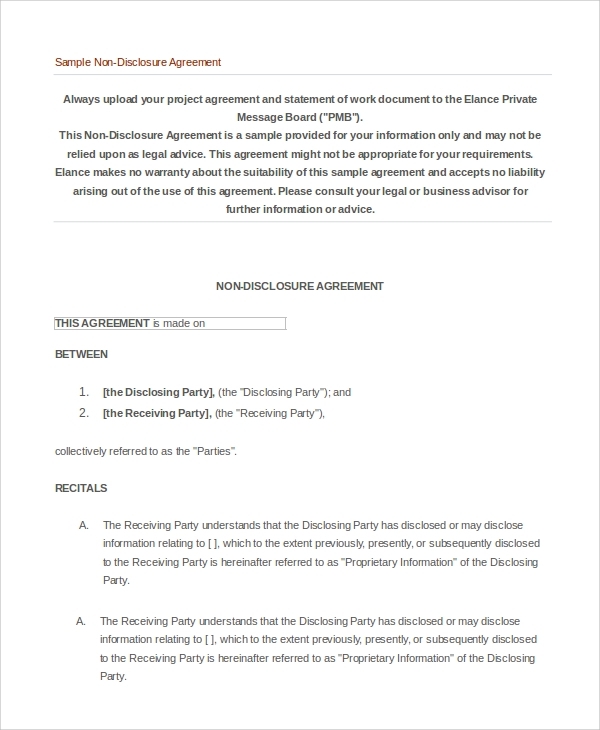 These are formatted in the form of separate paragraphs and signed upon by both the parties in the end. 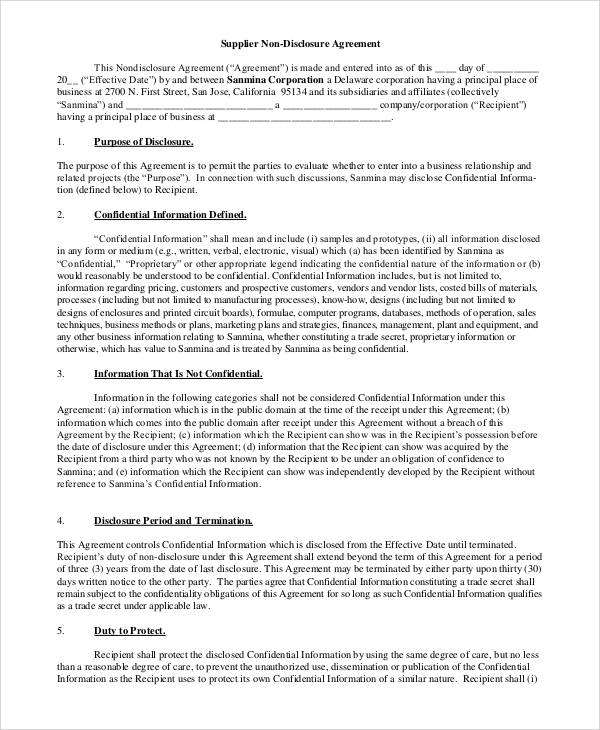 In a Sample NonDisclosure Agreements, the document may bear the name of one of the companies, along with the logo at the top. The names of the two parties who enter into the agreement are precisely placed in the first section of the agreement. Then the clauses of the agreement are listed in the template. These are placed in separate paragraphs or points, along with their corresponding numbers or bullet points. It is written in such a format that one finds it easy to scan the clauses. The contact information is also included in the contract, and the names of business partners are provided if required.